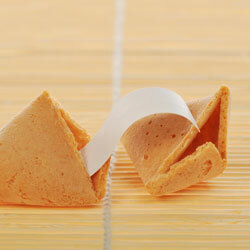 Fortune cookies are a fun way to end your meal, or just to have for an inspirational snack. Our cookies are baked fresh to order and are individually packaged in cellophane. Bulk/Wholesale cookies come with Generic Messages only. The Minimum order is 400 cookies or 1 box. $100.00/box.